We focus on whole-home performance to make sure your comfort is always set to happy! Your home is a system, and its components all contribute to your comfort, health, safety and energy efficiency. This approach looks at how improvements throughout your home work together to give you the most cost effective results. In fact, the house as-a-system approach can reduce homeowner annual utility bills by as much as 50%. And perhaps even more important, you'll feel more comfortable and have peace of mind knowing that your home is safe. We'll pinpoint hard–to–find leaks, check for inefficiencies in your heating and cooling systems, measure indoor air quality and show you any number of ways to conserve hot water and electricity. We'll start by asking you where you've noticed problems: rooms that are routinely too hot or too cold, or places where you often feel a draft. We'll also examine your energy bills to get an idea of how much energy you're using. The next step is a thorough evaluation. Your energy auditor will use blower doors, a specialized system uses forced air to show us where the leaks are. 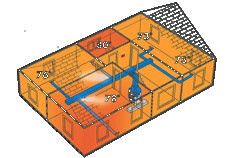 Plus infrared cameras, to see where air may be infiltrating, or insulation may be inadequate. And search for other hazards, like carbon monoxide, or potential problems with gas– or oil–fired equipment. We'll look at your house as a whole, not in separate parts. If one component of your comfort system isn't working properly, it will strain the others. Take your car, for example: it has four tires, but one flat will affect the whole vehicle. So while you might think you're fixing your system by buying, say, a new heat pump — in reality, a larger, more expensive problem may be lurking further down the line. Most importantly, we'll separate "need to do" from "nice to do." Some contractors will take advantage of an emergency to sell you something you don't need. Or sell you an expensive furnace or heat pump without addressing larger issues. At A.J. Michaels, we don't work that way. We explain what we've found, then tell you what's urgent and what isn't. We actually "do" the work. After you determine what work you would like done, A.J. Michaels is one of the very few contractors around that actually implements the measures. Unlike other auditors who only audit; or home performance companies that are not licensed to perform duct sealing and HVAC; or HVAC companies that don't insulate or seal, A.J. Michaels has on–staff BPI–certified professionals; we're a fully licensed HVAC company; and employ and own our own home performance team and equipment. And after we're done, we'll repeat the inspection and submit for rebates. Once work is finished, we'll perform a "Test–Out" process, to make sure we've accomplished what we promised — and that you're happy with results. Finally, we'll handle submitting all the paperwork to get you all applicable home performance rebates through the EmPOWER program. That's the way we do it, so there's no doubt about it.